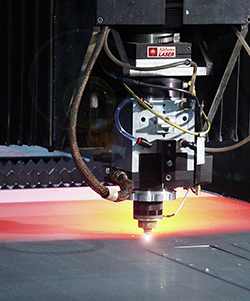 Over thirty laser systems, including flat sheet cutters, tube cutters, 5-axis lasers, laser etchers, and many other laser systems for various projects, make us one of the largest and most complete laser service centers in the United States. With our background in making material evaluation supplies out of hundreds of different alloys (including brass, copper, aluminum, titanium, and exotic alloys), Alabama Laser has manufacturing experience in a wide range of materials and thicknesses. Our systems group designs and builds custom laser systems. The engineering depth and research provided by this affiliation gives us a competitive edge in the latest advances in laser technology. Alabama Laser is one of the only ISO 9001 certified laser service centers in the Southeast. As a branch of Alabama Specialty Products, Inc., (an OEM for products used in corrosion monitoring and medical industries), Alabama Laser understands manufacturing from the standpoint of both a laser service center and an OEM. For an OEM, reliability is a critical factor. Alabama Laser stands behind its delivery times and quality of parts. To better meet your critical delivery requirements, we offer the ability to deliver your parts on our own fleet of trucks. Complementing our laser systems is a full capacity precision machine shop and welding shop that allow all of your manufacturing to be performed at one location. When rapid turnaround on your parts is needed, having immediate access to material is crucial. We keep a large raw material inventory to meet our customers demands. By ordering in bulk, we are able to obtain high quality material. A Branch of Alabama Specialty Products, Inc.